Someday My Favorite: Love Notes. There must be something in the air. Or maybe it is simply something the few brain cells I have left that are not dedicated to the feeding, changing, playing, and caring for two girlies under the age of nineteen months have been consumed by as of late? Either way, I, along with a host of others, have been thinking about caring. Odd concept, but I have been rather discouraged with myself and my lack of caring. It is so easy to read a [insert favorite social media] feed/blogroll and become numb to what people are talking about. We, the corporate, are such over sharers. Ironically, Kerry and I have felt that we know less and less about our friends and family. We are so guilty of allowing the posted snippets of people's lives to take the place of a phone call, a coffee date, a handwritten note... We have hardened our lives to our strict schedules with a few minutes of occasional "updates." We miss these personal things. We long for these things. Are we alone in this? Needless to say, when I saw this on Instagram, I had to check it out. Have you noticed the button in the sidebar? It is a challenge issued by a two bloggers, In Honor of Design and Dean Street Society. What a sweet challenge! It is something that Kerry and I are trying to be mindful of during the month of March. Just little things here and there, and you know what? It has been a wee bit difficult. It is a different mindset and it takes more time, yet it is meaningful beyond measure. We have taken a break from our Facebook news feeds to make more time for picking up the phone, writing that note, etc. With two girls, we have this urgency to let them know that they are beautiful. What a good way to let them in on how important it is to encourage beauty in each and every person. So, today my #encouragebeauty looked like this. Awhile back I snagged two punches that make little notes that you score and fold. 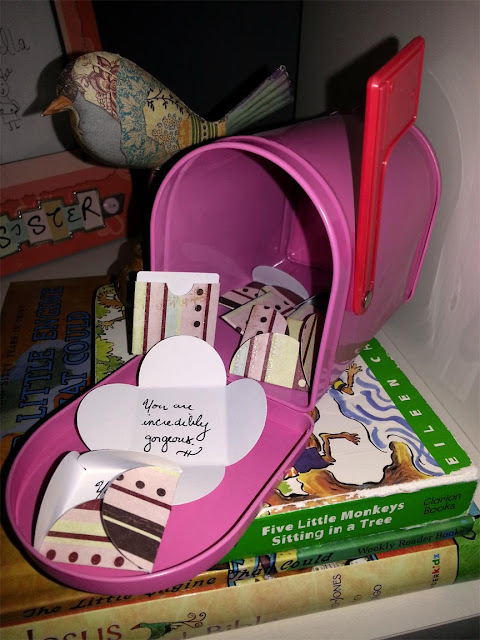 Both girls have little mailboxes (I heart Target $1.00 section) on their bookshelves. During a rare simultaneous afternoon nap, I wrote the girls little love notes. Care to join the challenge? We really aren't filling anything out or hash tagging every day. It is just something that we have had on our hearts and seemed like a tangible challenge to live out.